I love reading books to my children that have a story that they can identify with. Annabella Giggles All Day! is the perfect example of that. Annabella is perfect for young readers ages 3 to 7, so it was perfect for my children ages almost 3 and 5. I really enjoyed how the book was written so that it was very easy for the children to understand. The illustrations were really very pretty and colorful. My daughter was able to follow along with the pictures and pair them with what I was saying. 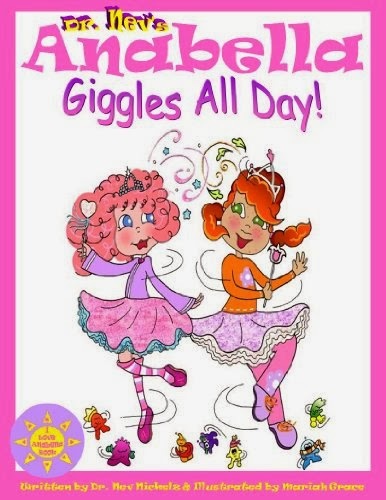 In Dr. Nev’s Annabella Giggles All Day is about a little girl named Annabella who hurts her best friend’s feelings after she can’t stop laughing at her rosy cheeks. I really liked that my children were able to see that even though you are someone’s best friend you can still hurt their feelings. We read our version on our Kindle, but if you do not have a Kindle you can still easily read the books on your computer! Seems like a sweet story! yeah, it does sound like a sweet story. I’m sure it helps kids to learn how to deal with criticism in a constructive way – and also learn that we have to be mindful of what we say to others. Sometimes we don’t intend to hurt feelings, but we do. Thanks so much for this excellent review. Thanks so much for linking up with us at the homeschoollinkup!